The PR firms must be moonlighting (ha, ha!) on behalf of the Honourable Society of Vampires, as they’re getting some pretty highbrow press these days. Only half joking: the New Scientist carried a piece about a Venetian ‘Vampire’ that had a few of their website commentators groaning (in effect) that the publication was carrying the academic equivalent of Reality Star’s wedding. (A little dismissive of Matteo Borrini of the University of Florence, who presented his thoughts at American Academy of Forensic Sciences in Denver). However, the reality isn’t that bad. The woman found in the small island of Lazzaretto Nuovo in the Venice lagoon could well have been regarded as a ‘vampire’ within her own era, and here’s how. There were also differently named revenants from other areas whose activities and identifying features were the same as those of the vampire. The German undead were called “nachzehrer” (translated as “night-waster”), for example, and their first tendency was to consume their own shroud and extremities, before they moved onto their families. Here we can already see that ‘vampire’ is only one word for a more widespread phenomenon. It may not have been the most appropriate word for a Venetian revenant, but it conveys a sense of the species we’re dealing with. There are two interesting themes here: one is that the revenant’s own extremities were the first to fall prey to his preternatural hunger. The second is that the next natural group of victims was the nachzehrer’s own kin. This munching occurred especially at times of plague. Two German publications, De Masticatione Mortuorum (That the Dead Chew) (1679) and De Masticatione Moritorum in Tumulis Liber (That Dead Men Chew in their Coffins) (1728) both discussed the phenomenon. One recounted that a woman in Bohemia (modern Czech Republic) ate half her winding sheet in 1345. In the time of Luther a man and a woman buried at the same time had “gnawed out each other’s vitals” (entrails). In Moravia (also modern CR) a dead man had devoured the winding sheet of the woman buried next to him. In areas of Germanic influence, the dead often had stones and gags put in the mouths at burial to stop them biting in this way. There are other funerary practices in other places which speak of immobilising the mouth, suggesting that the issues faced by people in central Europe were shared over a wider territory. 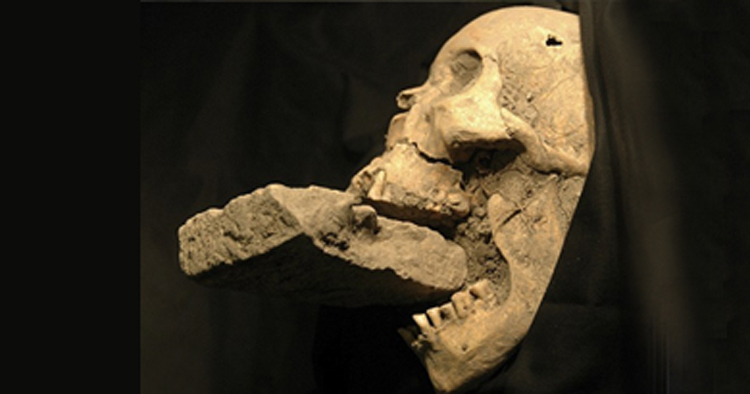 The Venetian vampire was found with a ‘small brick’ in her mouth. Without a better model, it seems people may have felt that impeding post-mortem munching also impeded the metaphysical act of ‘vampiric’ draining which would, in turn, lead to more death. Generally, the corpse’s bodily parts that were cited as consumed were the parts that one would expect to fall victim either to decomposition (such as finger ends), or carrion eaters (such as entrails). And why were the smacking, chewing and snuffling sounds were especially heard at times of plague? During times of epidemic death, the corpses mount up at an unmanageable rate, so burials are likely to be closer to the surface where high temperatures can foster bacterial activity and where the resultant popping and movement can be heard. The Venice vampire herself was removed from a mass grave of victims of the plague of 1576, attesting to the dire funereal efficiencies necessary in such dreadful times. And onto the second matter, of families: they are the natural food of the recently dead in folklore, because epidemic death is contagious. Those closest in contact with the recent victim and his pathogens were real candidates for disease, an easily observable fact even before the germ theory provided a scientific model of pestilence. The National Gallery houses a painting by Canaletto (about 1735) which depicts the celebrations of the feast day of St Roch in commemoration of those who died in the 1576 outbreak (which regrettably included Titian). Thanks were also given to the saint for his intercession in bringing the pestilence to an end. St Roch was regularly invoked in relation to the plague and his feast day was August 16th, but whether this is thought to be an anniversary of the end of the outbreak is unclear. It would certainly unlikely if Venice were a little more northerly. Plague – and vampires – were notorious in Europe for peaking in the autumn, by consequence of the fact that plague’s natural vector (the rat flea) thrived during the heat of the summer months when rats could eat and breed easily. Add a little time for incubation and a little more for the disease to transmit and peak through a human population and there you have it … why vampires visit in the autumn.